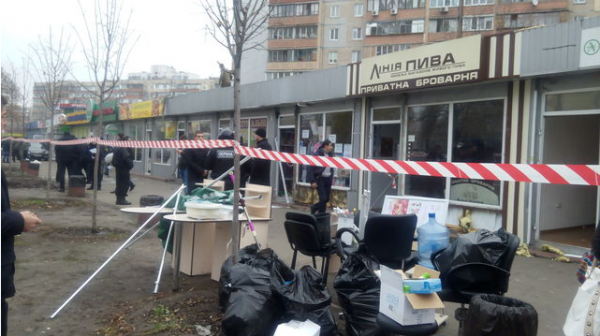 On December 23th at the session of Kharkiv City Council the deputies approved a mechanism for demolition of facilities built illegally, without land acquisition or not paying rent and land tax. Thus, all the installed stalls in the city fall under the demolition. Entrepreneurs are going to challenge this decision in court. As the officials explained, the project is designed for the purpose of the city improvement and filling the budget. However, entrepreneurs claim that the officials are cunning. According to the head of Association of Private Employers, Alexander Chumak, last three years the City Council did not make decisions on the allocation for small architectural forms and did not extend the lease agreements for previously allocated objects. “It is not possible to obtain a permission for the placement of these buildings. And as there is no permission, stalls may be deemed illegal and subjected to the demolition. This is actually a corruption scheme that allows to put pressure on business,” said Alexander Chumak. “Since the end of 2011, no land was allocated for this issue, – the question simply was not submitted to the session of the City Council. Therefore, all the stalls installed since 2011 are illegal in fact. But those who set up their stalls legally before 2011 and pay land taxes, they are also in a semi-legal status, since the lease was not extended. Although according to the Land Code the contract should be extended. We have appealed to Gennady Kernes, and we were told: “Julia Svetlichnaya passed a legislation act that land is allocated on a competitive basis.” the chairman of the Kharkov city organization of trade union of entrepreneurs, Alexander Sharmar, added. According to Alexander Chumak, on the eve of the session, Kharkiv entrepreneurs have decided that they would challenge the decision in court. “It can be challenged in court and canceled almost immediately after its adoption. We already have an experience in the abolition of the regulatory act to raise the rents of land in Valka (Kharkiv region) in 2013,” he stated.